Math was never a strong suit for me. Mr. Donscheski knew it. 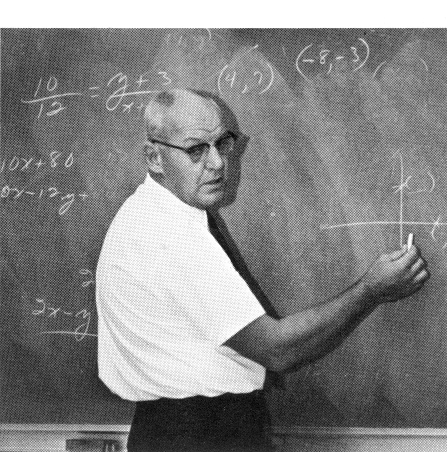 From the outset, he and my friend Ernie T. were determined I would pass his pre-calculus class. Many a lunch period was spent in the classroom, and at my friend’s home, while they went over the material from previous classes. Math never clicked for me. It is mostly visual. I DO NOT learn visually. I learn by hearing. Something I would not discover till college. He might have been just another Math Teacher. But he also taught the value of investing time in another person. Yeah. The time I spend mentoring others in the Linux operating system, came from Mr. Donscheski. He listened, and he was always there. That is not all he taught. He was the advisor for the local Key Club (Kiwanis Educates Youth.) Another lesson he taught: civic pride, and civic responsibility. Want to change your corner of the universe? This is where you start. The Key Club would meet Saturday mornings after football games, and clean up the stadium. Why? Because Key Club earned money for cleaning up. He seemed to live at school. You would find him there, during lunch, after school, and Saturday mornings. We would attend the local Kiwanis meetings. Anyone who was anyone in my little hamlet, was there. They taught me that one person does make a difference. In my senior year, I and a couple of other students, became involved with the Cystic Fibrosis Foundation, through the efforts of the local Kiwanis Chapter. It was Mr. Donscheski’s fault. What I did in my senior year with Key Club, did not go unnoticed. At the meeting of the California/Nevada/Hawaii (Cal-Nava-Ha) District, I received KEY Club’s highest honour: The Sandy Nininger Award. The award is presented to KEY Clubber’s who have gone “above and beyond” the call of duty. What? Me? Yes. Me! Who is Sandy Nininger? He was the first soldier in World War II, to be posthumously given the Medal of Honour. I may have gotten a C- in Math, but the inspiration infused by a dedicated teacher who gave freely of himself, was also honoured. He was the behind-the-scenes teacher. The values he taught continue to inspire and guide me, as I do volunteer work today. It is difficult to find dedicated teachers. You know what I mean. People who invest time in their students, and infuse life, with some of their exuberance. Sadly, these series of tributes come too late. While my mind is still conscious, I will tell the tale, of how they transformed me. Robert Drescher. Chemistry teacher at my local high school. I guess the first thing you notice about him, is his bow tie. He was unconventional from the beginning. 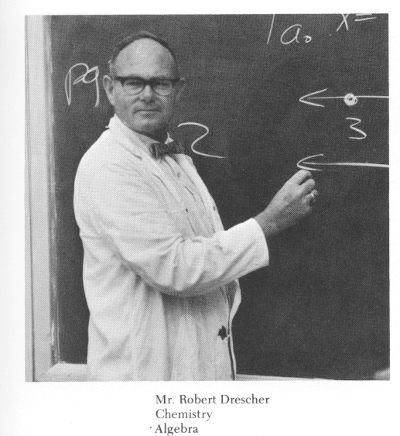 Mr. Drescher had a passion for trivia and obscure information. Each day we were greeted with some bit of trivia carefully crafted on the board. Chemistry may have been what he was teaching, but he also taught an appreciation for irrelevancy. So began my own quest for resolutely insignificant information. His interest in weather, did not go un-noticed. We were always free to check the barometric pressure, on his ancient barometer. Yes, it had a column of mercury. Today, I collect rain data for cocorahs.org. (Community Collaborative Rain, Hail and Snow Network) I remember Mr. Drescher, with each bit of rain data I report. Everything I know about Chemistry, atoms, and Quantum Mechanics, started here. He made Chemistry anything but mundane or ordinary. I was hooked. In my senior year, I took an independent study in Honours Chemistry. I was privileged to be with him a second year. He never could quite pronounce my Italian last name. So I was called Mr. Gur. It worked.